This special DVD is for use with Cinemavision during a MRI scan for patients of all ages. The DVD contains high definition 2-hour soothing video of various nature scenes and calming music. This special DVD and copyright is available only to facilities that have or are purchasing Cinemavision. Copyright infringement issues: Cinemavision systems can play any DVD, however there is a potential infringement issue doing that. All commercial DVD’s contain a copyright that implies that if a Hospital or Imaging center shows that DVD to a patient during a MRI scan, and then charges for that MRI scan, they may be liable for infringement actions. Warning: The owner has licensed the content contained in this DVD for private home use only. Unless otherwise expressly licensed by the owner, all other rights are reserved. Any unauthorized copying, editing, exhibition, renting hiring, exchanging, lending, public performances, receiving compensation, or broadcast, in whole or in part, is strictly prohibited. Any such action establishes liability for a civil action and may give rise to criminal prosecution. Exceptions to Copyright infringement: Patients who bring a personal DVD, especially children, may watch that DVD since they own it, and can view and listen using Cinemavision. 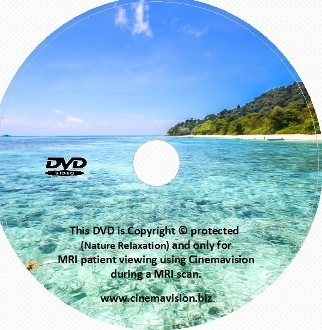 The DVD we offer includes a copyright license in the price for exclusive use on Cinemavision during a MRI Scan for any patient. This DVD video, sound, music, content was created and is owned by David Huting Nature Relaxation, 4426 Louisiana Street San Diego CA 92116. The DVD has been licensed to the owner of www.cinemavision.biz Salvadorini Consulting LLC.